Box: New Contents: New Version: 2016 IELLO version Box has been opened. Cards have never been used. box - very good contents- very good this is the second edition. Was Dead of Winter. Will submit an empty want list. Was The Others. Will submit an empty want list. Was Tsuro of the Seas. Will submit an empty want list. Like New - Game removed from shrink wrap. Pieces Punched, never played. Box - Very Good Condition Contents - Very Good Condition Used and discarded a handful of score sheets. Comment (added Wed, 27 Feb 2019 20:52:58 +0000): No sir! That's just a close up of the bottom of box. Scoring track / game board is perfectly fine. (the bottom of the box has a picture of the scoring track). Contents: Very Good. Some cards are still sealed. Box: Very Good. Version: English second edition (2017), has Dice Tower seal on back Sweeteners: "Vast: The Crystal Caverns – Miniatures Expansion rank=118 rating=8.79 " Contents: Very Good. Box: Very Good. "Vast: The Fearsome Foes (2018) rating=7.72 " Contents: New in shrink. Box: New in shrink. "Vast: The Crystal Caverns – Bonus Cards (2017) rating=7.69 " Contents: New in shrink. Box: New in shrink. Box condition: Very good Content condition: Very good; Played once Version: English first edition (2018) Publisher: Z-Man Games, Inc.
"Alien Frontiers: Premium Pack" (snazzier than the regular version). Brand New: In Original Packaging *comes with: Red, blue, green, and yellow scoring rockets for Alien Frontiers. In shrink sweetener: "Doomtown: Reloaded – New Town, New Rules (2014) rating=7.58 (New Town New Rules expansion)"
Rio Grande / Kosmos older edition. good condition, wear (no tear). Bought brand new. Never played. In shrink brand new KS edition with exclusive miniatures and King Henry VIII miniature add-on. Box condition: Acceptable/Good; One small cut on the opening flap; Dent along bottom box Content condition: Very good; Played a couple times in one session only Version: English/French edition (2018) Publisher: Spin Master Ltd. Box condition: Good; One minor ding on the corner Content condition: Very good; Played once; Cards were sleeved before first play Version: English edition (2016) Publisher: Z-Man Games, Inc.
"Life is Strange rating=8.16 " Edition: Standard PS4 edition Condition: Like New. Played a few times. "Wonder Boy III: The Dragon's Trap rank=2117 rating=9.09 " Edition: Standard PS4 edition Condition: Like New. Played a few times. "Brothers: A Tale of Two Sons rank=357 rating=7.68 " Edition: Standard PS4 edition Condition: Like New. Played a few times. Brand New: In Shrink Sweetener: Brand New: In Shrink "Killer Bunnies and the Journey to Jupiter (2008) rank=15081 rating=5.65 "
Version: English edition (latest release I think) Condition: New in shrink Box has some creasing, one slightly smooshed corner and some shelf wear. Shrink is intact. CSE Games English Kickstarter edition. Opened & played a couple of times. Very good condition. Box is structurally in very good condition. It has some very light water damage on the back (see below). Sweetener: "Cthulhu Rising (2008) rank=15910 rating=5.19 " Twilight Creations/English. Opened, punched, unplayed. In Very Good condition. Sunrise Tornado Games, English Like New condition. Opened & played a couple times. This is a pre-publication/review copy. It did not come with a scorekeeping card (you'd have to use paper & pencil or some other method to keep track of round scores), but, otherwise, I don't think it's significantly different from the published copy. All are Brand New: 2013 Edition - 1st English Edition, 5th Printing Sweeteners: "Munchkin Cthulhu 3: The Unspeakable Vault (2008) rating=6.55 " "Munchkin Cthulhu 4: Crazed Caverns (2010) rating=6.69 "
Dominion (2008) Hardly played, but I've had it for a while so I'd say the box is in good condition. All components present. Sweetener: "Dominion: Intrigue (2009) rank=59 rating=7.74 " (2009) Same condition. Fantastiqa: The Rucksack Edition (2012) Played once, excellent condition, all components present. Forbidden Desert Excellent condition. All components present. This is the original Thunderstone. All components present, hardly used. Zeppelin Attack! Never played, excellent condition. Harry Potter: Hogwarts Battle. Excellent condition, never even opened "books" other than the first one. Onirim second edition. Includes 7 (seven!) expansions. Excellent condition. Edition: English first edition (2013) Condition: Box and components in great shape No insert in the box. All the characters are bagged separately. Yes lots of bags! Will add a new item with just the base game and submit a blank trade list for this Edition: First edition (2015) Condition: Box and components in great shape. Game was played with Sleeves (sleeves not included) EDIT: removed expansion item (no sweetener) Sweeteners: "Pax Pamir: Khyber Knives (2016) rating=8.38 "
Edition: First edition (2013) Condition: Box has a lot of wear and a damaged corner, whitening on edges/etc Components in good shape. Publisher: Iello Games Box & Components Details: Very good condition. Sweetener: "Zombie 15': Left Alone – Solo Campaign (2015) rating=7.06 (Zombie 15': Left Alone – Solo Campaign)"
Publisher: Plaid Hat Games Box & Components Details: Received in a previous math trade. In very good condition. Publisher: Games Workshop Box & Components Details: Brand new in box. Shrink removed, but minis are still in their sprues. Publisher: Games Workshop Box & Components Details: Like new. One miniature assembled (Space Marine on the bike) but otherwise all other miniatures are still on their sprues. Publisher: Roxley Box & Components Details: Very good Sweeteners: "Risk: Star Wars Edition (2015) rank=727 rating=7.12 (Risk: Star Wars Black Edition)" Received in a previous math trade, the game is opened but unplayed and all components are like new. Comes with a laminated reference sheet, supplied by the previous owner. Publisher: Passport Games Box & Components Details: Good - regular shelf wear on the box, components are in very good condition. Passport games edition, as pictured. Publisher: Fantasy Flight Games Box & Components Details: Brand new, sealed. Brand new. Plastic case a little ripped but you wouldn't keep it anyway...it's like those annoying plastic packaging you find batteries come in. Contents: Good. Box: Good. Version: Hybrid [plastic cards] edition (2018) Other: This is a second copy. Edit: Crossed out "Other" as this is now my only copy for the math trade. Brand New: Premium Sleeved Sweetener: "Random Encounter: Plains of the Troll King (2016) rank=14908 rating=5.11 " *Only Sealed deck available. Edition: As Pictured. Game: Tokens unpunched. Cards still bagged. ALL miniatures are missing. Box: In good condition. Description: I got this as a door prize at September TABSCon 2017. It appears to have never been played and all the components are accounted for except the miniatures which have been removed. Good for any fan of Cadwallon - the new owner can proxy with minis of his/her own. Edition: English. As pictured. Game: Like new condition. A revised printed copy of the rule book is included, including FAQ. Components have been errata corrected and players aid cards are also included. Box: Excellent. Description: Opened and components have been sorted. Never played. Smoke & pet free home. Edition: As pictured. Game: Plastic pieces are nigh indestructible :D. Dry erase markers work. Player books are good. Game board is good. Box: Very good. Other: Received from previous owner in a sale. Game is OOP and is not being reprinted. Edition: English first edition (2017). As pictured. Game: Very good condition. Box: Very good condition. Other: Received from previous owner in trade. Edition: English-only second edition (2016) - "Ultimate Edition" As pictured. Game: Very good condition. Box: Very good condition. Other: Received from previous owner in trade. "Hive Carbon" (not "Hive Pocket") edition. Edition: English/French edition 2015. As pictured. Game: Excellent condition - plastic pieces are practically indestructible. Box: N/A - only tiles and bag. Other: Received from previous owner in sale. Edition: Multilingual edition. As pictured. Game: In shrink. Box: Excellent condition. Edition: First edition (2015). As pictured. Game: Excellent condition. Components bagged. Box: Excellent condition. Other: Received from previous owner in trade. Edition: English edition (2015). As pictured. Game: Excellent condition. Components bagged. Box: Excellent condition. Other: Received from previous owner in sale. Edition: Similar to picture - in English. Game: Excellent condition. Box: N/A. Other: This is a paper map received as a promo at the ELGX expo in Mississauga in 2018. 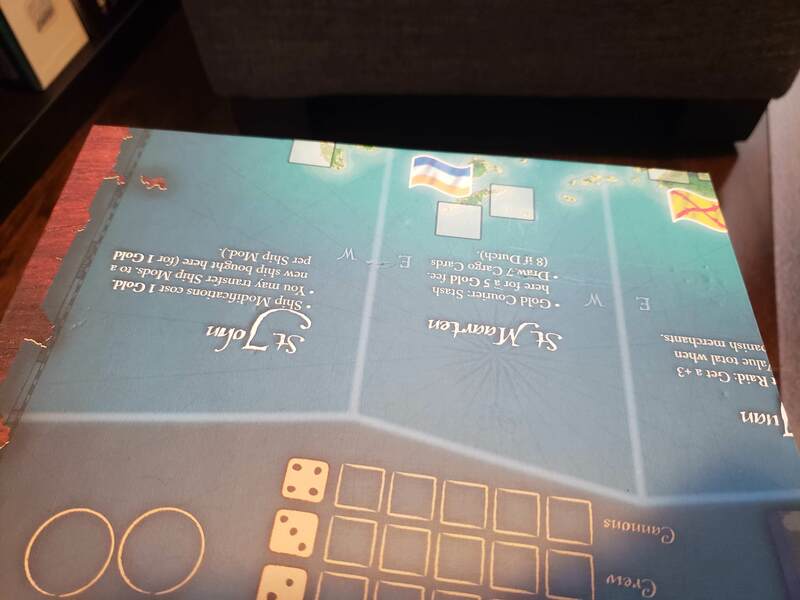 It's a scenario meant to be used with the Catan: Seafarers expansion. It's very hard to come by and would be perfect for any Catan enthusiast. Item condition: Brand New Box condition: Brand New Edition: Newest 2017/2018? Version: 2F 2014 printing. Game: Very good. Punched and complete, never played. Box: Like new. 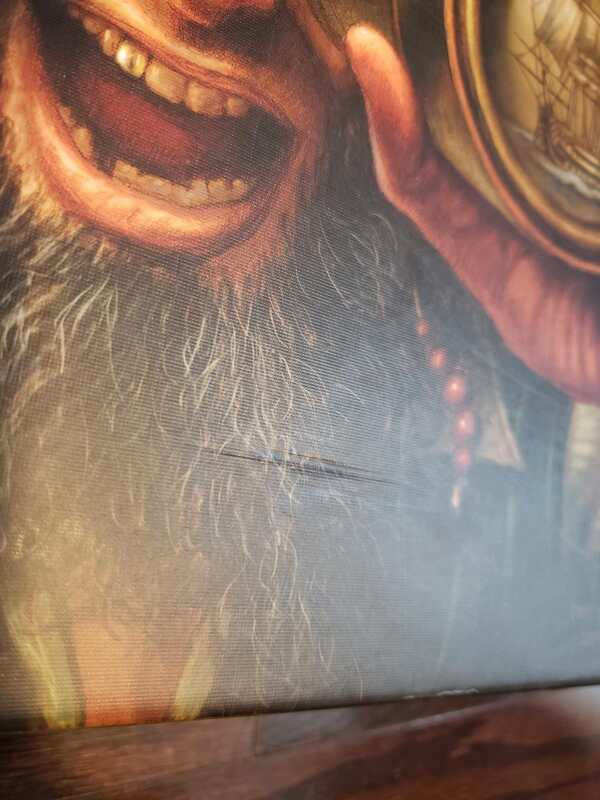 Minimal box wear, I received the game in shrink. Brand New: In Original Packaging. Contents: Good. Cards sleeved. Box: Good. Version: English first edition (2018) Other: This is a second copy. Sweetener: "Rise of Tribes: Deluxe Upgrade rating=9 " Contents: Opened, never used. Box: Opened, never used. Stored inside base game's box. Version: English first edition (2018) Other: This is a second copy. Edit: To say this is the only copy I have now. From Kickstarter edition (2014) Sweetener: "Robinson Crusoe: Adventures on the Cursed Island – Spyglass of Illusory Hope (2014) rating=6.24 "
Expansions 2 and 3 for "Munchkin (2001) rank=3649 rating=5.92 " "Munchkin 2: Unnatural Axe (2002) rating=6.44 " Version: 16th Printing Contents: Very Good Box: Good Sweetener: "Munchkin 3: Clerical Errors (2003) rating=6.47 " Version:11th Printing Contents: Very Good Box: Good - Slight tear from opening the box. Not structural. All cards are present but not all are separated. In good condition, was sleeved and won't come sleeved. One of the voting tokens is missing but I threw in a chip to make it even. It does not impact the game in any way. Sweetener "Bob Ross: Art of Chill Game (2017) rank=1647 rating=7 (Bob Ross The Art of Chill Game)" In good condition, played a few times. Some cards are sleeved. Due to the unorthodox card size, you need to butcher your sleeves to use it on these cards. [thing=4390]Carcassonne: Hunters and Gatherers [/thing] IMPORTANT Box is not in good condition. One of the corners is flaring out but the corner structure is intact. There is "brown cardboard" exposure on all four corners. There is plenty of white shelf wear. The bottom box also has some "brown exposure" showing the board and a few flairs. Structurally, the box is fine with all the corners intact. This is something you would find in a thrift store that was well-loved. One of the green token discs is missing, not required to enjoy the game "Tichu (1991) rank=130 rating=7.58 (Tichu)" Edition pictured. Some wear on the box but the cards are in good condition. Bought new, played a few times. Excellent condition, only played a few times. The makers may not work anymore, though. Played once so 4 of the 'tongues' are a little dusty. Still in good condition, though. German version, but rules are available online. Excellent condition, only played once. Played a few times. In descent condition. Sweetener: "S'getti Scatter (1994) rating=4.66 (S'getti Scatter )" - box not very sturdy and not standing up to use particularly well. "New Mouse Trap (2004) rank=16610 rating=4.39 (Mouse Trap)" - Well used but everything is working. Played once. In excellent condition. Played a couple of times. In excellent condition. Adorable sock matching game with everything present. Played a few times, but in good condition. Sweetener: "The Game of Life (1960) rank=16805 rating=4.22 ( The Game of Life)" Played a few times but in descent condition. The version pictures here. Played only a couple of times. In excellent condition. Played once or twice. Like new. Earlier printing with discs and cubes. Sorry, no animeeples. Sweetener: "Agricola: The Legen*dairy Forest-Deck (2010) rating=6.38 (The Legen*dairy Forest-Deck)"
Played a few times but in good condition. Box: Good Content: Good, sleeved Sweetener: "Empires: Galactic Rebellion – Oligarchs Expansion (2016) rating=6.8 ", "Empires: Galactic Rebellion – Faction Power Cards (2017) rating=6.5 "
Box: Good, some shelf wear Content: Good, sleeved Version: Updated to latest Version through KS Sweetner: "Argonauts: Wrath of Gods Mini Expansion (2015) rating=7.09 "
Box: Acceptable, shows signs of wear Content: Good Version: Ferti 3D board edition (2007), Language: Dutch/French/German, includes English Printout. Game itself is not language dependent. Box: Good Content: Good, Sleeved. Sweetner: "Galactic Strike Force: Guardians of Volneth (2014) rating=6.28 ", "Galactic Strike Force: Spaceship Miniatures rank=428 rating=6.14 ", "Galactic Strike Force: Playmat rating=7 "
Box: Good Content: Good Sweetner: "Run, Fight, or Die! 5/6 Player Expansion (2014) rating=6.87 ", "Run, Fight, or Die! Expansion Pack 3 (2014) rating=7.1 ", "Run, Fight, or Die! : Big Box (2015) rating=6.66 "
Box: Good Content: Good Sleeved Sweetner: "Shadows of Malice: Seekers of a Hidden Light (2015) rating=8.09 "
Condition: New Note: this listing is for the grey twin promo card. Condition: New Note: to be clear, this listing is for the purple #2 geisha only. Contents: Very Good. Cards were sleeved. Will not come sleeved. Box: Very Good. One whitened corner. New, Unplayed. Sleeved and in top loader. English. Contents: Good. Played twice. Box: Good. Two of the corner sides shows indentation. Version: English edition (2018) edit: Updated box condition. Contents: Good, some wear here and there on cards. Box: Good. Version: Multilingual edition, not sure which edition but was bought in 2016. Box: Like New. Contents: Shrink wrapped. Notes: Opened to read instructions but unplayed. Sweeteners: "Alien Wars (2015) rank=11431 rating=5.76 "
Box: Good. Contents: Good. Notes: Received in previous math trade. Box: Good. Contents: Good. Edition: TMG Kickstarter English First Edition Notes: Received in previous math trade Sweeteners: "Ground Floor: Overfunding Achievements (2012) rating=7.35 "
Notes: Received in previous math trade. Edition same as depicted on picture. Sweeteners: "Catan Card Game: Artisans & Benefactors (2006) rating=7.09 "
Box: Good Contents: Good, Sleeved Notes: Received in previous trade. Sweeteners: "Posthuman: Defiant Expansion (2015) rating=6.65 (Posthuman: Defiant Expansion)" Box: Contents included in main box, expansion box included. Contents: Like new (opened and sorted pieces, but never played) Box: Very good. Minor corner wear. $5 Gift Card Delivered electronically. Rajas of the Ganges: Snake Expansion English/German. New unpunched. sweetener "Black Stories: Spiel 2018 Edition (2018) rating=4.9 (Black Stories: Spiel 2018 Edition)" English/German. New in shrink. Deception/CS-Files: Premium Role Card Pack New. English. In shrink. Eight-Minute Empire: Europe Expansion Board New in shrink. English. Components are in like new condition. Has not been played. The box lid is very slightly creased along one of the sides and a little bit of whitening on one corner, but no other ware or markings. Sweeter: The rare “Baby Blitz” expansion. Like new, unpunched, unplayed and zero ware. "Duel in the Dark: Baby Blitz (2008) rating=7.45 "
In very good condition and has not been played. Very slight shelf ware on the box. Like new condition all round. NO shelf ware on the box. Slight damage on one corner of the box. Came this way from 401 Games, but all components are in good condition. Hardly played. 1st printing Edit: edition Sweetener: Two of the player boards have acrylic overlays with backboards from Board Game Boost. These are really nice! Comment (added Sun, 17 Mar 2019 14:05:48 +0000): I have the 1st printing, with the misprinted tile. You can get the replacement from Eggertspeile or print out the sticker to apply to one side of the tile. I haven’t fixed that tile as I have only played it a few times and when I did the misprint didn’t affect the game for me. Like New. Unpunched. Never played. Some very light shelf ware ‘whitening’ on the box corners. Moderate shelf ware on the box. Components are all in very good condition and a printout of the English rules is included. Like new condition all round. Played once. Sweetener: the Patronus expansion. Never played. "Peloponnes Card Game: Patronus (2016) rating=7.47 "
Like new, mint. 2016 Edition. Played once. Like new condition. Very slight shelf ware ‘whitening’ on 1 corner of the box. Otherwise, mint. Box - Good. Some shelf wear and some cupping of lid (see pictures) Contents - Good/Very Good. Wonders were sleeved (won't come sleeved). Sweeteners : "7 Wonders Duel: The Messe Essen Promo Card (2015) rating=7.35 (7 Wonders Duel: The Messe Essen Promo Card)" "7 Wonders Duel: Statue of Liberty (2016) rating=7.4 (7 Wonders Duel: Statue of Liberty)" "7 Wonders Duel: Stonehenge rank=220 rating=6.77 (7 Wonders Duel: Stonehenge)" "7 Wonders Duel: Sagrada Familia rank=180 rating=6.92 (7 Wonders Duel: Sagrada Familia)" All promos like new, unplayed. box - like new contents- comes with broken token insert ! box - like new , excellent condition. contents- played 2-3 times. Box/Contents - New in Shrink. English, no damage to box. English. Even though unplayed, card shows some wear from shipping. sweetener: "Sagrada: Promo 4 – BoardGameGeek Window Pattern Card (2017) rating=7.53 (Sagrada: Promo 4 – BoardGameGeek Window Pattern Card)" new, unplayed, no noticeable wear. Box - Very Good Contents - Very Good Retail Edition. English. Version: Eagle Games, English Box condition: Very good, minor scuffs on corners Components: Complete, very good, all cards sleeved Sweeteners: "Baseball Highlights: 2045 – Big Fly! Expansion (2015) rating=7.69 " "Baseball Highlights: 2045 – Robot Hitters Expansion (2015) rating=7.66 " "Baseball Highlights: 2045 – Rally Cap Expansion (2015) rating=7.71 " "Baseball Highlights: 2045 – Cyborg Pitchers Expansion (2015) rating=7.73 " "Baseball Highlights: 2045 – Naturals & Magna Glove Expansion (2015) rating=7.78 "
Box: Got rid of original box and store everything in expansion box (like new condition) Contents: Like New Sweetener:"Ghost Stories: White Moon (2009) rating=7.91 "
Box: Moderate Shelf Wear (white corners) Contents: Sleeved. Minimal wear Sweetener:"Cutthroat Caverns: Deeper & Darker (2007) rating=7.12 "
Box and Contents - New in Shrink. Box and content - like new. Played 3 times. Publisher: Matagot Edition: English edition (2016) Box Condition: Very Good Components: Complete, Good condition. Like new English 2nd edition. Opened played once, everything is mint. Publisher: Fantasy Flight Games Edition: English First Edition 2011 Box Condition: Has some wear, and minor scratches. Come with custom foam insert Components: Good, come with some of LOTR sleeves Sweetener: "The Lord of the Rings: The Card Game – Fog on the Barrow-downs (2014) rating=7.91 " Publisher: Fantasy Flight Games Edition: English Edition 2014 Box Condition: no box, inside the base Components: like new. Publisher: Fantasy Flight Games Edition: English Edition Box Condition: Like New, minor shelf wear Components: Complete, components in great condition. Cards have been taken out of seals but never played, tokens have not been punched. Publisher: Repos Production Edition: English Third Edition 2017 Run: WG2017R14 Box Condition: Has some wear at the corner of the box Components: Good Sweetener: "7 Wonders Duel: Pantheon (2016) rating=8.08 " Publisher: Repos Production Edition: English Edition 2016 Box Condition: no box, inside the base Components: Good. Box: Very Good Contents: Very Good Comments: Played only twice. Box: Very Good Contents: Very Good Comments: Acquired from a previous trade but never played since then. Everything is in excellent condition. Box: Very Good Contents: Very Good Comments: Acquired from previous trade and played only once. Everything in excellent condition. Box: Very Good Contents: Very Good Comments: Acquired from previous trade. Played twice solo and everything in excellent condition. New: Shrink wrap tear on the whole of bottom & a bit ding at the top corner of the box. Comment (added Mon, 18 Mar 2019 02:44:30 +0000): True, I mean it's not opened, but you are right. Box: like New Contents: Like New Kickstarter Edition. Box: Good (comes with the box from the Arctic Bounty Kickstarter) Components: Acceptable, received in a previous math trade. Only about half of the fish meeples were included though. The rest can be replaced with generic cubes. SWEETENER (all in big box): "Fleet: Arctic Bounty (2014) rating=7.65 " "Fleet: Wharfside Casino (2012) rating=6.84 " "Fleet: Salvage Yard Licenses (2012) rating=7.31 " "Fleet: Inuit Fisherman (2012) rating=7.26 " "Fleet: Crab Meeples (2014) rating=7.2 " "Fleet: Nunavut Weather Authority (2012) rating=6.58 " "Fleet: Salty Captains (2012) rating=7.29 "
2012 First edition Box:Good condition Contents: Good condition, missing one life counter.